If you are one of the fans of the innovative technology today, maybe you’ll find that adding a digital voice assistant to your home is a must-have. Not only that it is the perfect match to nowadays modern homes, but it also a helpful tool that will make your life easier. Since shopping for an excellent choice is daunting, we’ve brought to you one of the products that you might want to try. One product that captures our attention is the Echo Dot 2nd Generation. It is an excellent alternative if you are looking to upgrade your home stereo system and enjoy a hassle-free living. But what’s in it that will make us say that its functionality is competitive? Check out how competitive this product is, and feel free to give your own verdict. The Echo Dot is a small, rounded device that looks versatile at first glance. It can be due to its size which is only 3.3 x 3.3 x 1.3 inches. It is available in two classy colors, which are black and white, and matches every home design. It’s simple style will not interfere with your furniture or other appliance. The top edge is surrounded by LED lights that indicate if the device is powered. It has perforated dots that serve as speakers with lights on it. You can easily find the buttons on its top. It looks easy to operate since they are all gathered in one place. These buttons include volume controls, action menu, and a key with a microphone sign that will allow you to enable or disable the speaker. You can also notice that its bottom part is coated, allowing it to sit in its place without slipping. Therefore, you can safely put it on top of a table or counter without any worries although it is lightweight. It only weighs 5.7 ounces, enabling you to move it from one place to another any time you want to rearrange your living room. 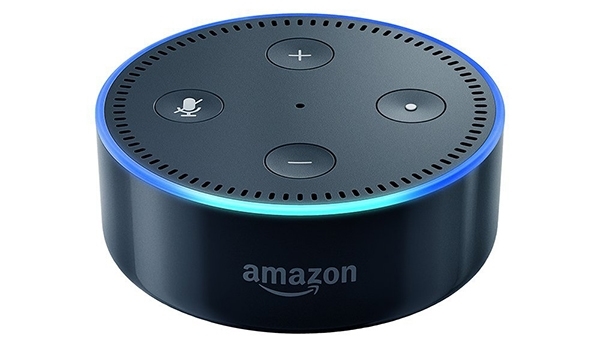 The Echo Dot 2nd generation needs to be plugged in every time it is used. You can use a third-party battery case with it if you want to bring it with you on the go. With this in mind, we love its versatility and every aspect we look at it. It has its own built-in speaker, but you can also connect it to another speaker if you think the latter is better than this. Simply open the Bluetooth of each device and pair them. Or, you may also use any physical connection like a 3.5-millimeter cable. To do it, you must keep the other device at least three feet away from the Echo Dot. Then, open the Alexa app via Google Play or iTunes. The app will guide you through to complete the setup. You can either control the volume on the Echo Dot or Alexa. But for us, it is easier to use the latter because you will only need to perform a voice command. Take note the Echo Dot can only connect to one device via Bluetooth. You may also do it through a voice command. Generally, the Echo Dot is very simple to set up without giving you a lot of turnarounds. You can do a wide variety of activities without the need of going anywhere or pressing a lot of keys. The Echo Dot is even more versatile when you utilize the Alexa app. This smart assistant allows you to play music, listen to the weather or news advisory, get updates from your favorite sporting team, listen to audiobooks, check available products, and find best shows or movies. It will also make you more productive because it enables you to create your to-do lists for the entire week and set yourself a reminder. If you are planning to go anywhere, this smart device allows you to check the traffic before you leave home. You can also control your lights and thermostat settings without leaving your couch. All these controls can be performed with just a quick-to-do and impressive voice command. Just imagine how easy life is using it! For more quality features, try connecting the Alexa to some third-party apps that will allow you to turn the Echo Dot into a gaming device or even a food delivery service. We think the audio is one of the most crucial things that you should find in a smart device designed specifically for home stereo systems. It will not fail you when it comes to music streaming. It is integrated into various apps that most people are going crazy having them. Some of them are Spotify, Pandora, Amazon Prime Music, iHeartRadio, TuneIn, and Audible. Now, you can stream music from high-quality providers using your speakers. However, despite these amazing qualities, we have seen one drawback which we think is vital to consider. We have noticed that the bass offers a loud and clear sound, but becomes distorted when the volume is raised. It means that you can fully enjoy the music unless you want to listen to a party-like sound that echoes all throughout your home. We love the innovative look and feel of the Echo Dot 2nd generation. Not to mention its integration with other apps that make it so competitive. If you are indeed a music lover and you are one of the avid subscribers of music apps, then, this smart device is perfect for you. On the other hand, if you want a louder sound that will fill the entire space of your home, most especially if you want use it for a small get together party, then, you have first to decide if it is an excellent option for you. Overall, we find the Echo Dot 2nd generation as a competitive device that can match other gadgets that were created nowadays. It is sufficiently versatile, well-designed, innovative, and hassle-free to use. Despite its drawbacks, we still consider it a must-have. For us, this smart equipment is a must-have because it is one of the cheapest products with outstanding productivity features.